Bowser has stolen the Star Rod which makes all his wishes come true. He lifts Peach's castle into the sky on top of his own fortress and makes himself invincible, beating Mario and sending him tumbling to the ground. Mario is helped by a Goomba family and he is joined by Goombario on his quest to find the seven Star Spirits and use their power to stop Bowser from taking over the Mushroom Kingdom. 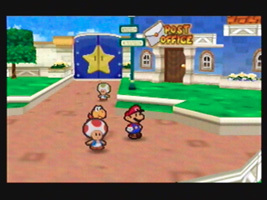 Mario is also joined by other characters, each with their own abilities that let Mario access new regions and help him out in the turn-based battles. Mario can use weapons, items and badges to improve his stats	as he takes on stronger and stronger opponents. In the haunted mansion, find a room with a vase in the center. Jump inside the vase, and Mario jumps out again as an 8-bit sprite, as he appeared in the arcade Donkey Kong. When you jump back into the vase or exit the room Mario returns to normal. "I remember the carefree days when we played Golf and Tennis and had Parties." Page 3 of the diary makes reference to the Nintendo 64. "I heard that a lot of Shy Guys also appeared in Toad Town. Supposedly, they came from Shy Guy's Toy Box. It must be somewhere in town. A Toy Box... I wouldn't mind seeing that. Maybe they have a Nintendo 64!" Together, Page 2 and Page 7 seem to be indirectly referencing the then-future title Luigi's Mansion. "Because you're my secret diary, I'll tell you the truth: Yaaaah! I hate ghosts!! What will I do if it appears at night! Come back, Mario! I'm scared! Yikes! I can feel something behind me. Ahhh! I'm sure it's there, but I can't look back! No! No! Get away! I think I'll be safe if I don't freeze with fear. I'll just shut my eyes and take five steps back, and then I'll jump and dash into bed. Here I go!" "I heard a rumor that I actually have lots of fans. Wow! What great news! To live up to their expectations, I want to play the lead in an adventure! Of course, my name would have to be in the title. That'd be sweet... But I know it'll never happen..."
On any of the new chapter screens (where the chapter number is shown) don't touch anything on the screen for a while. Eventually the original Super Mario Bros. theme will begin to play. Minh T., the flower loving Toad in Toad Town Garden, is named Lip in the Japanese version. Lip was also the name of the flower fairy protagonist of Intelligent Systems' Panel de Pon. Both characters share a love of flowers and even share the same yellow, green and pink colour scheme. The Big Cookie made by Tayce T. includes two cookies that first appeared in the puzzle game Yoshi's Cookie. The train that takes you to Dry Dry Desert is the same train that appeared on the Kalimari Desert track in Mario Kart 64.